After an awesome concert in Osaka in an awesome first class music hall yesterday, I can’t say the same for the Nagoya Concert. 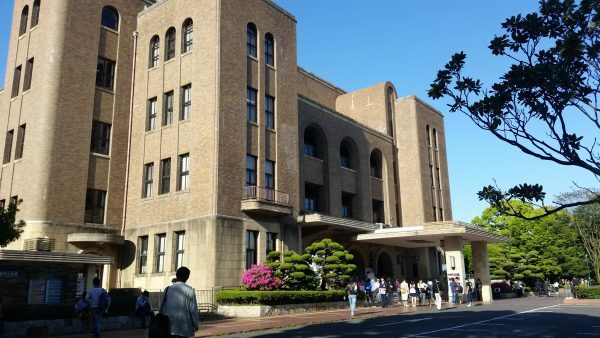 Yukirin’s 3rd stop in her 1st First National Tour was Nagoya, at the Nagoya Civic Assembly Hall on April 22, 2016. There wasn’t room inside the building as the lobby area was pretty small so the concert goods were sold outside, luckily the weather was awesome so all fans stood around the building. 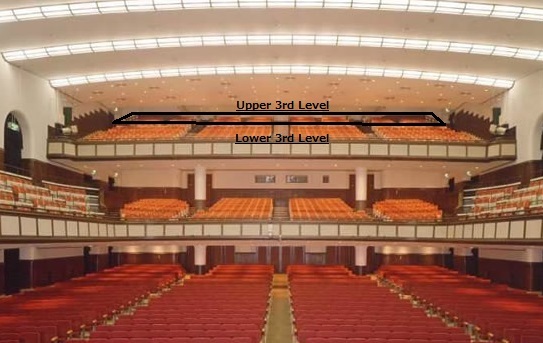 My seat for the concert wasn’t great (almost last row in the 3rd level), but the design of the hall made it even worse. I will explain. The hall wasn’t designed to be a music hall. It was built back in the 1930’s and used a lot as a boxing and theatre venue. The seats were also really tight, I felt bad for the fans around me because they were squished, it was worse than airplane seats. There are 3 levels, however, the 3rd level is split by lower 3rd and upper 3rd. The ceiling of the lower 3rd blocks part of the upper 3rd level. So the view of the stage gets blocked by that lower ceiling. BUT…It’s a Yukirin concert and after the Osaka concert, I was really excited once again to see another Yukirin concert and of course, to hear Green Flash again. The concert finally starts although a bit late and there was no kage-ona but we all noticed a problem!!! Nobody in the upper 3rd level can see the stage, because everyone in the lower 3rd was standing up. Remember I mention that the lower 3rd ceiling blocks our view, now the lower 3rd audience blocked that remaining view. So anyways, was this how we were going to be enjoying this Nagoya concert? During the first VTR, a man from the upper 3rd area went down to all the sections of the lower 3rd and asked them not to stand up because otherwise no one in the upper 3rd could see the stage. 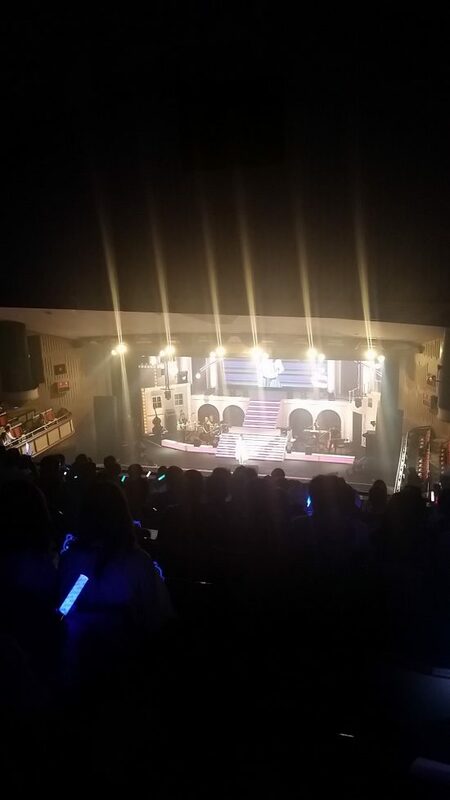 When Yukirin came back out for the next song, 99% of the people sitting in the lower 3rd did not stand up. Another reminder that I was in Japan. I couldn’t believe it!!! For the rest of the concert, people in the lower 3rd did not stand up. I could see the stage and Yukirin!!! Since it was just a wall behind me, I sat on top of the seat portion instead of sitting on the folded down seat part so I was able to see the stage even better. NOTE: I took the pictures because I was not that happy about the view and wanted to vent since I paid for a blocked view (lol). For first four songs I couldn’t see anything, so I was focused on the sound. Yukirin was a bit unstable during the first few songs. Yukirin wasn’t out of tune or anything but volume and tone wise was not as comparable to Osaka’s concert. During the Yukirin Time VTR, where she played the dice game, the dice was recycled from the Osaka VTR (since she just recorded them back to back) so the dice had a big X on one of the face which had the words Osaka and then Nagoya was scribbled under the X. Yukirin also joked about the Dice being recycled. Yukirin’s singing definitely got stronger after the VTR. Green Flash was amazing, the green hue within the venue was so amazing! Yukirin did a better job unzipping the dress for Zipper compared to the Osaka concert. 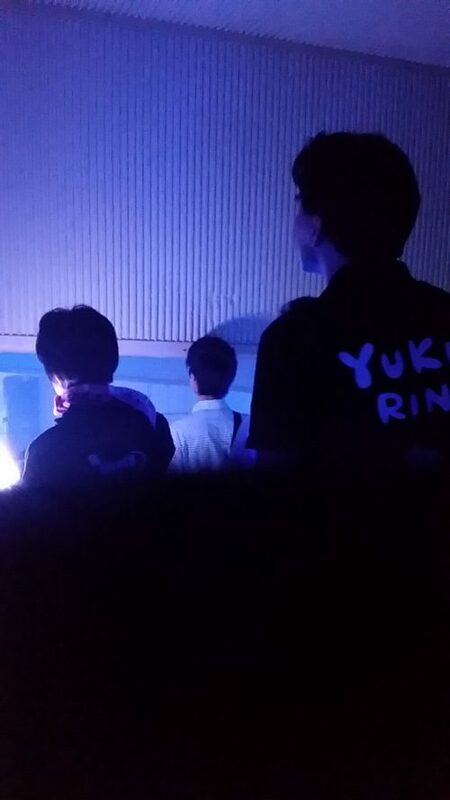 During the first MC, Yukirin talked about the venue a bit and said it was an “interesting” place (I totally agree with you Yukirin and you’re not even sitting up here!) She also talked about the weather since it was pouring the day before in Osaka but the weather in Nagoya was really nice. I expected Yukirin to perform Pareo no Emerald as the Nagoya specific song since she had performed it before and is a crowd favourite but the 2nd song was definitely a surprise. The whole crowd went “ohhhh” when we realized it was Zutto Mae Kara. 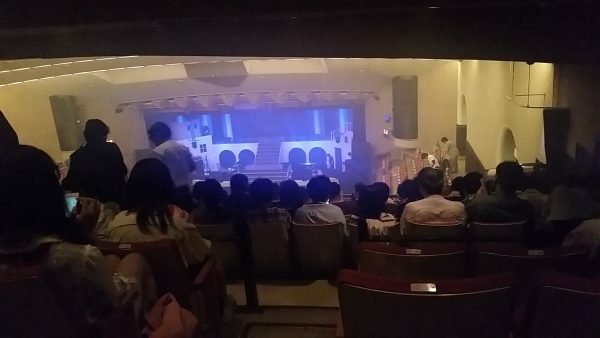 Because the venue is a lot smaller compared to Osaka Festival Hall, Yukirin was closer to the audience. I was able to see Yukirin clearly since she was raised up on a swing for Yokaze no Shiwaza but because of the lower ceiling, I can’t see the upper part of the screen. These 4 songs were acoustic version. The venue disappoints once again because the instruments didn’t sound that great which was a waste of a live band. Ayasa’s violin parts sounded really sharp and you don’t hear the bass clearly. The music sounded really muffled at times. If I hadn’t gone to Osaka’s concert first, I probably wouldn’t have been as critical I think. 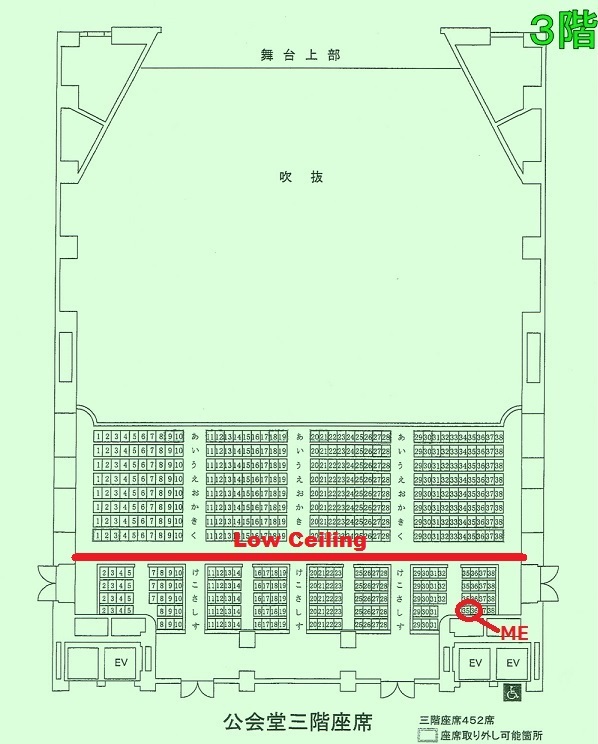 The Nagoya Civic Assembly Hall does have some acoustical panels and diffracting designed walls but overall not that great. Live version of Halloween Night is just amazing. I can’t listen to any other versions anymore. The Nagoya Concert wasn’t as memorable as my experience in Osaka but it was still a wonderful Yukirin concert (although it may not seem like I enjoyed it from this report lol). I obviously didn’t enjoy it as much as Osaka Concert (some may have noticed I was tweeting a lot during the concert lol). I was slightly frustrated that they sold these upper 3rd level tickets (because Yukirin can sell) because the upper 3rd level was really blocked view seats. 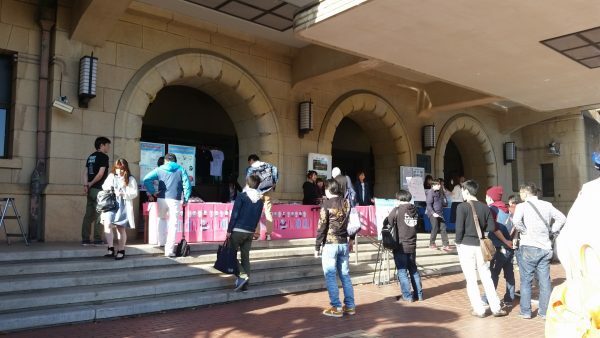 I also felt that Yukirin deserved to sing at better music halls compared to this one. 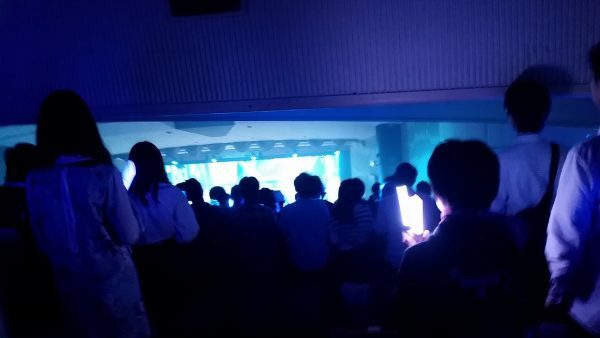 I saw many tweets from people who also sat in the upper 3rd who were not happy about the view but really happy about Yukirin’s concert. 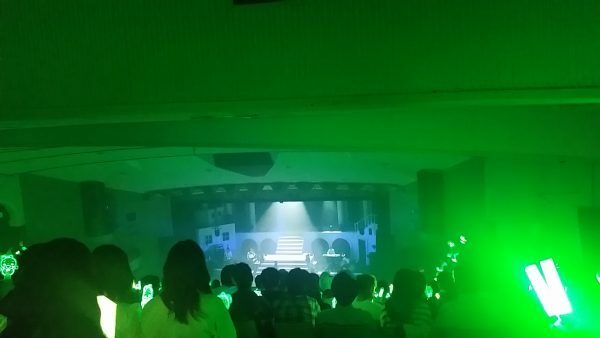 Green Flash was cemented as my favourite song of Yukirin’s Solo Tour. Thanks for the Nagoya concert report!! I remember you were tweeting a lot more during this show for all the reasons you listed above, knew then that you were not going to have this one as your favorite!! LOL ya, it was pretty obvious wasn’t it?